Solution Manager or SolMan is important part of Application Lifecycle Management (ALM). It supports SAP systems in trough entire lifecycle like: Business Blueprint creation, configuration, template management, test management, production operation/monitoring, Change Control Management, IT Service Management, documentation, SAP Engagement and Service Delivery, upgrade management, custom code management etc. One important thing is here also which was introduced by SolMam. This affects SAP basis ground work which is patching of the systems – implementing Support Packages (SP) / Support Packages Stacks (SPS). SP/SPS package delivery requires approval as of April 2nd, 2007. There is a precise message like that: [Package of this category delivered after April 2nd, 2007 will require approval]. This practically means that you are not able to download any SP from SMP directly via SAP Download Manager. Simply such downloads are disabled. In the Download Basket of Download Manager there is additional tab called "Approval List". All packages that require approval are initially display here. Only once they are approved the respective package is moved to the Download list tab. After that it can be downloaded. The only way how to get an approval to download it is via SolMan. 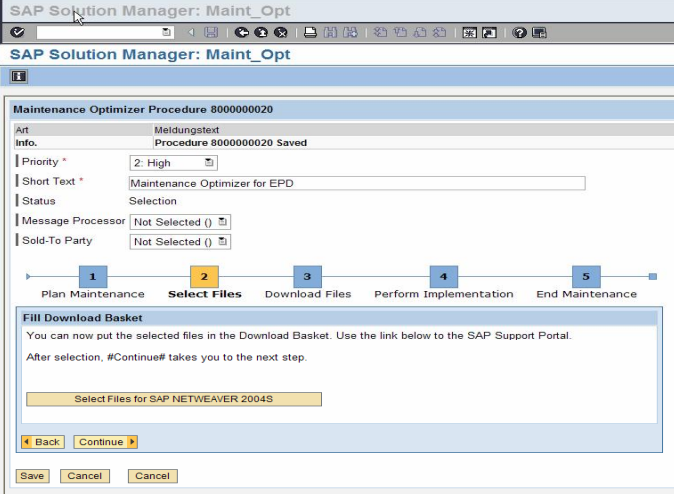 Normally we would do the confirmation of files for download via SolMan’s Maintenance Optimizer. In its Change Management section – in Maintenance Optimizer tool. However there is also different way of how to achieve that. Alternatively you can run ABAP report /TMWFLOW/RMOBASKETAPPROVAL or function module /TMWFLOW/MO_UI_BASKET_AUTHORIZ to do kind of manual approval. User is used the one which is associated in SolMan with user on SMP. While running one for those two ABAPs you get list of objects in the Download Manager. You just simple click on the object which you wish to approve and that’s it!